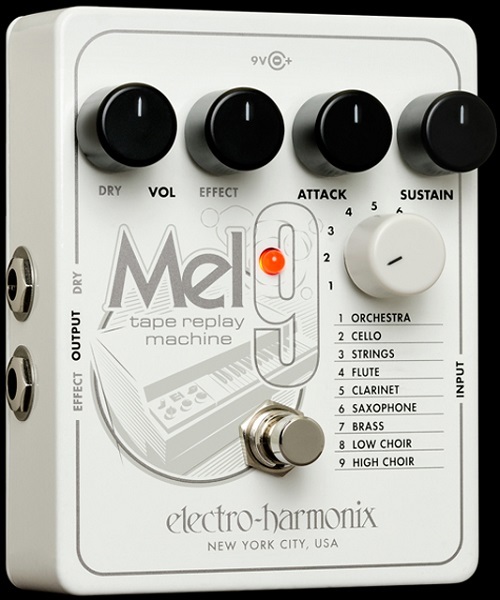 The polyphonic MEL9 from Electro-Harmonix uses the same extraordinary technology as the B9, C9 and KEY9 to transform your axe and resurrect the sound of vintage tape-based keyboards. – Works on guitar without modifications, special pickups or MIDI implementation and tracks bends, slides, even whammy dive bombs! – Sustain control adjusts the release time after a sound is stopped. As it’s turned clockwise, the fade out time increase.